Although “light tank” can be a generic term, in this case it refers to the series of light tanks (Marks I to VI) produced by Vickers for the British Army in the inter-war period. I’m not including the Mark VII Tetrarch or Mark VIII Harry Hopkins, as they were significantly different from the earlier versions, and would warrant separate posts. 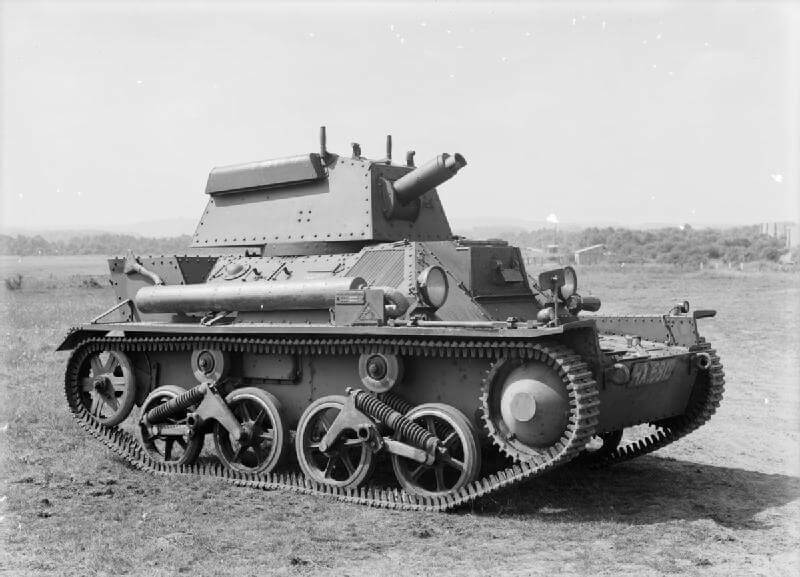 The Mark I Light Tank was developed from a design by Carden-Loyd, by then part of Vickers-Armstrong. Only about 9 or 10 were built, but experience gained was used in development of the Mark II, and then the Mark III and Mark IV. These first four versions were armed with a single 0.303″ Vickers machine gun, and had around 14mm of armour. The Mark V added a 0.50″ Vickers machine gun, giving the tank some measure of capability against other light tanks, and increased the crew from two to three (commander, gunner, and driver). The additional crewman made this version significantly more effective, since the commander was freed from having to operate the gun and radio. The Mark VI was the only version produced in significant numbers, with production running to 1,682 vehicles. The Mark VIA and Mark VIB variants had the same armament as the Mark V, but the Mark VIC increased armament again to one 15mm Besa machine gun and one 7.92mm Besa machine gun. All models saw were widely used for imperial policing duties in the British Empire, particularly India. When war broke out in 1939, more than 80% of the British Army’s tanks were Mark VI Light Tanks. Most tanks used by the BEF during the Battle of France in 1940 were Mark VI Light Tanks, and they made up more than half the tank strength during the battles against the Italians in North Africa during 1940. Mark VI Light Tanks also fought in the battles of Greece and Crete.